Rocketdyne SE 8-2 Apollo Command Module Reaction Control System (RCS) bi-propellant thrust chamber assembly manufactured second quarter 1964. The Command Module (CM) RCS provided the impulses required for controlling spacecraft rates and attitude during the terminal phases of the mission after separation of the CM from the Service Module (SM) through atmospheric reentry. Attitude control was critical to maintaining correct heatshield orientation while transiting the reentry corridor to splashdown. 12 of these pressure fed engines were installed on the CM and utilized the propellants Nitrogen Tetroxide (N2O4) as oxidizer and Monomethylydrazine (MMH) as fuel at a 2:1 ratio (by weight); pressurized helium gas served as the the propellant transferring agent. This propellant combination is hypergolic so no independent ignition source is necessary. SE-8's were integrated on the CM in 2 (redundant) systems of 6 engines, with individual thrust chambers provisioned to enable clockwise and counterclockwise roll, positive and negative yaw, and positive and negative pitch. The engine has the option of being pulse fired, producing short thrust impulses or continuously fired for steady state thrust level of 93 lbs/414 N with a specific impulse of 274 seconds. Because it is ablatively cooled, the SE 8-2 has a limited operational life (maximum aggregate firing time) of 130 seconds (Pulsing) or 273 seconds (including 200 seconds of steady state operations). The fuel and oxidizer engine injector valves contain orifices which meter the propellant flow at the 2.1:1 ratio. Injector valves were automatically controlled by the CM's controller reaction jet ON-OFF assembly (commanded via the Apollo Guidance Computer) or manually enabled in Direct Manual Mode for rotational maneuvers with the Rotation controller. Direct Manual mode also served as a backup mode to control RCS engine operation in the event ON-OFF mode fails. The SE 8-2 injector valves are spring-loaded closed, energized open and utilize two coaxially wound coils, one each respectively for the manual and direct manual mode. Ignition is approximately 14 millisecond from receipt of electrical command "ON" signal. The Injector consists of a 16 unlike doublet splash plate design, containing 16 fuel and 16 oxidizer passages that impinge upon a splash plate within the combustion chamber. The thrust chamber is fabricated in four segments, the combustion chamber ablative sleeve, throat insert, ablative material, asbestos and a fiberglass wrap. The inner section of the engine incorporates a 6 degree wrap ablative sleeve (pre-charred to eliminate the requirement for a crematic liner) with a graphite, zirconium diboride/silicon composite refractory throat insert. A 45 degree nozzle body comprised of high-silica, fabric-reinforced laminated phenolic wrapped ablator is externally covered by a fiber glass overwrap. The combustion chamber casing is a welded stainless steel can. Expansion ratio is 9:1. 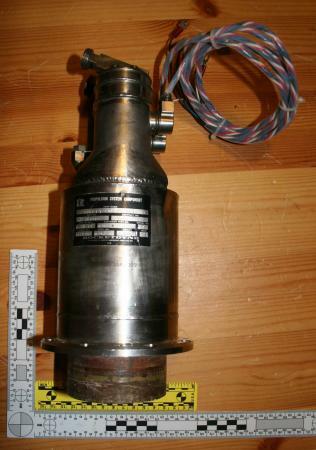 A conformal nozzle extension (not included on the artifact in this collection) is provided to duct the engine exhaust gases through the spacecraft heatshield (the extension does not significantly alter the engines expansion ratio and is scarfed after installation to match the precise contour of the Apollo Command Module's thermal protection system). A temperature control system incorporating transducers mounted on the engine injector was used to provide crew situational awareness (via a control panel indicator) of the engine temperature status. Prior to firing, if engine temperature was not within specs, the crew had the option of energizing the fuel and oxidizer solenoid control valve direct coils to heat up the engines to the requisite minimum temperature of -10F.